This week's Cold Start we talk DevOps tribalism, infrastructure as code, and reading #awswishlist tweets into a megaphone outside the new local AWS office. This week's Cold Start! 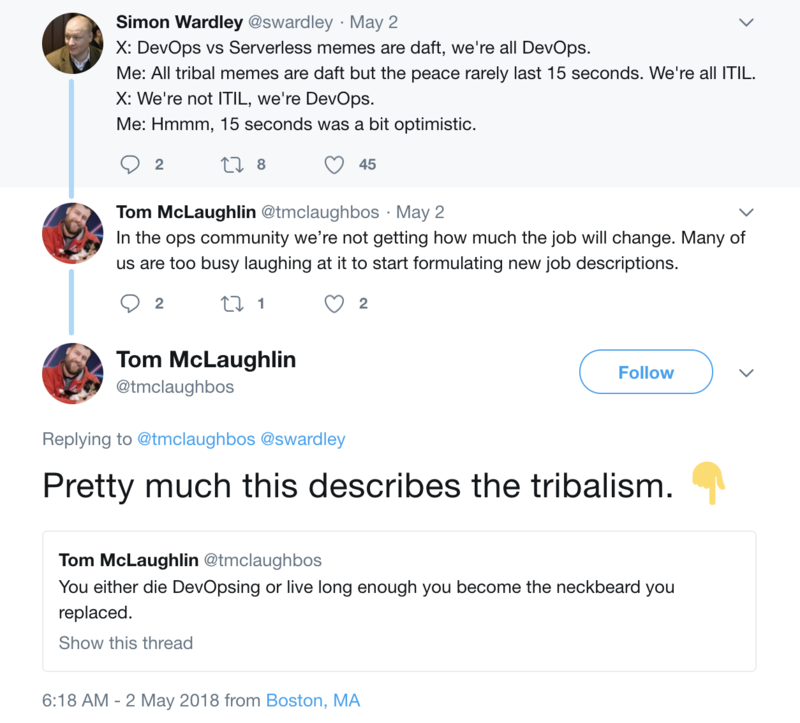 Let's discuss DevOps tribalism and repeating the same mistakes we did with that, infrastructure as code when serverless (and what we want from it), our threat to read #awswishlist tweets outside the next Boston Amazon office, and excessively using our own tweets to backup our point. Recently a job description made the rounds on DevOps Twitter. The post elicited the usual responses such as (paraphrasing) "What does that even mean? ", "This is why this field makes me cringe," and "I bet they want 5 years experience." All this felt wildly familiar. I’ve started coming to the realization that we’re repeating the same cycle we saw with DevOps and public cloud adoption. We’re too busy dismissing what’s coming because we think the name is dumb, we think people don’t understand our job, or just a general willingness to think our job will change. This attitude left too many of us poorly prepared for change in our careers. We were too busy laughing at the idea of a "DevOps engineer" because "what even is a 'DevOps Engineer'?" or "the job is just a sysadmin that codes and I already do that." That attitude left many of us in an uncomfortable position years later as we struggled to retain or find new employment. There’s no reason why serverless shouldn’t be as innocuous as saying container management; and yet it is. I think for those of us in both the DevOps and serverless communities it’s important for us to be vocal and articulate why and how serverless will change our jobs. From my experience at DevOpsDays Denver and DevOpsDays Seattle there are people receptive and ready to listen to our message. However, it’s going to be a slow and long journey. I hope, like what happened with the early days of DevOps, we don’t write each other off until many of us are forced to learn some hard career lessons. As a continuation of the Serverless Ops Blog series, we've published "Serverless Ops: Infrastructure As Code With AWS Serverless". Here we explore what infrastructure as code is, where the value of operations is (and it's not being able to start a service on a host), and what we'd like to see for managing AWS infrastructure as code going forward. It's a long read but well worth it. Even if you're not serverless already there's much to learn about your work today. Finally, Amazon has announced a new office in Boston and we have volunteered to read #awswishlist tweets if the serverless planning cabal ever meets there. We will also wear the AWS SAM outfit because if you make that ridiculous of a statement, then you have to accept when someone ups the absurdity on you. 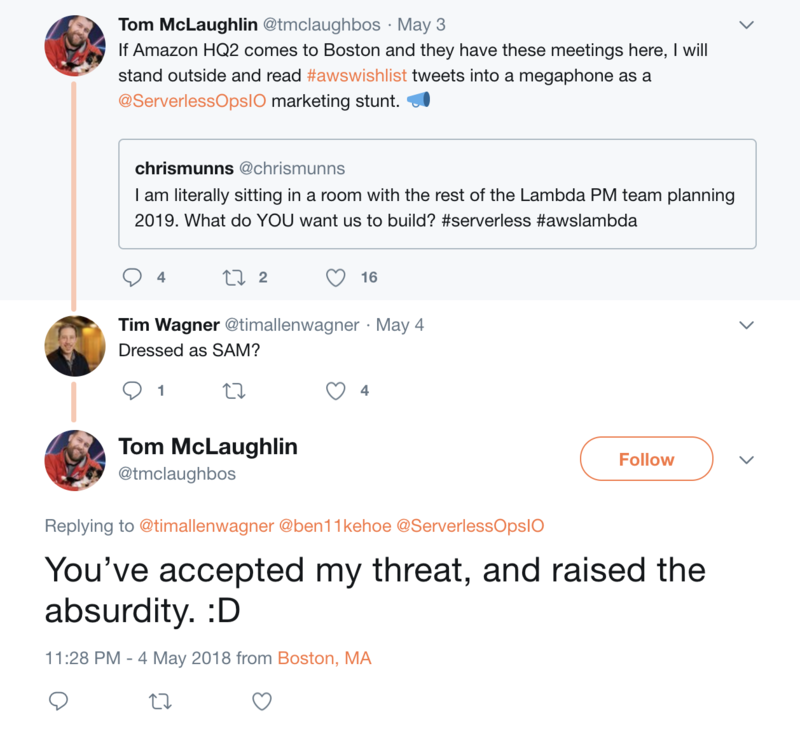 I'm Tom from ServerlessOps and we provide services to make you successful with your DevOps transformation and enhancement through AWS serverless adoption. Ask us about our training and advisory services. "Hey, can you enable this feature for me? I have a demo at 2." Would your engineers love to stop hearing that question? See how IOpipe's sales team uses LaunchDarkly to demo future features for their prospects. This idea shouldn't amaze us when you think about it. But how many of us still silo our engineering tools from other parts of our organization instead of using them to connect teams? Picture what you'd need to do to stand up a new AWS region in your infrastructure for EC2 hosts. Just think about the configuration management infrastructure, monitoring, and other support services that go into the process. Is your infrastructure code even flexible enough to support more than us-east-1 in the first place? Now imagine skipping much of that work and getting up and running in an hour. Alex Casalboni is one of the first people I really started talking to in the serverless community. We even had a chance to meet this past year at AWS re:Invent. He's a tireless advocate and supporter of the AWS serverless ecosystem and this is a great interview of him from datree.io. On-prem serverless: does it make sense for you? We're bearish on private serverless and consider it a repeat of the private cloud debate. Much of the value of serverless, as with public cloud, is offloading undifferentiated work to someone else. Your customer doesn't care if you run AWS Lambda or Kubernetes, they care that your product or service meets their needs. However, public cloud doesn't meet everyone's needs. In particular, regulated industries. In that case, does serverless fit in? If this topic interests you, it may also be worth reading "The Future of Kubernetes Is Serverless" too.